Gasification in southern localities of Moldova, modernization of hospitals and improvement of infrastructure. These are some of demands told by the residents of Cahul and Cantemir in the meeting with PDM delegation. 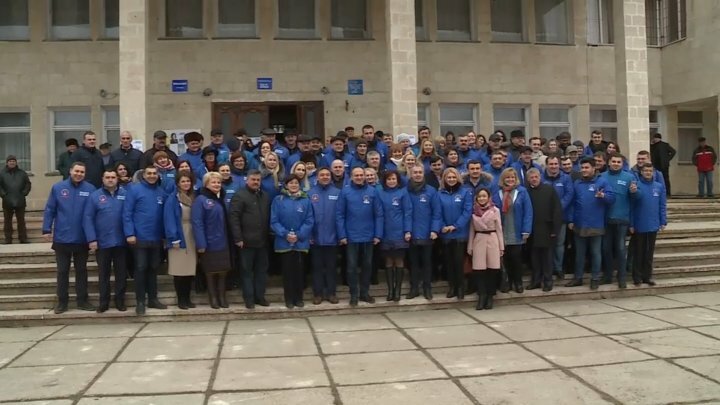 PDM representatives arrived in Zîrneşti village in Cahul where people discussed the achievements of the government in recent years, particularly the increase in salary, pensions and social package. "Together with us today are people or a part of persons who assumed responsibilities in difficult moments of the Republic of Moldova. They've taken the responsibilities to lead the country while others were sitting in bushes. " "Everybody is happy now. As a director, I earned before 2200 lei but now I have my salary of 6000 lei. I'm really glad!" "When we made a decision, we took the responsibility. When we raised the salary, pension, we had to calculate and analyze the budget if we would carry out the First House project, the Good Roads project", said PDM vice-president, Andrian Candu. Democratic Party candidate on constituency no. 43, Oleg Creciun, surgeon and district hospital director, says he intends to improve the health situation by upgrading the hospitals. "I'm a doctor who dream to make as much contribution as possible. We went into the emergency room, then we changed the emergency unit", said the PDM candidate in the constituency no. 43, Cahul, Oleg Creciun. In the city of Cahul, members of the Democratic Party paid a visit to the market. The PDM caravan also reached Cantemir. People said that they want modern infrastructure. "In the first working visit, we discussed with all heads of districts and already we started a 4-year program to raise 80% gasification". Elena Bacalu, the Democratic candidate in the constituency 42, told the people that she knew their problems and would tackle everything together with PDM team. "We have problem with water supply, sewerage, roads. We will resolve everything together with our PDM team", declared the PDM candidate in the constituency no. 42, Cantemir and Cahul, Elena Bacalu. Constituency no. 42 includes ten localities in the Cantemir district and 26 in the Cahul district.